Duty calls this weekend and I have to work today so Hockey Time is going to have call in sick so I'll make it quick. This weeks Game of the Week is Pittsburgh at Washington.....great game with some of hockey's biggest stars on display. Everyone will be talking about the Ovechkin and Crosby match-up but I'll take Malkin over Sid the Kid anyday of the week. 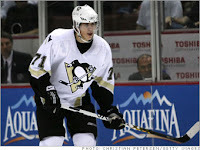 Malkin leads the league in points, has more points and goals than Crosby, and is general a more physical player. Didn’t have time to put the entire video collection together but we did manage to get this weeks Ovechkin goal. I’m not going to say this is the best goal I’ve ever seen but it definetly ranks in the top 10. Now I may not have had time to put all of the highlights for this week together but don’t think for a second we forgot about the Ice Girls. There is always time for Ice Girls! This week we’ll take a look at the Chicago Blackhawks Ice Girls! Until next week……..C-Ya!